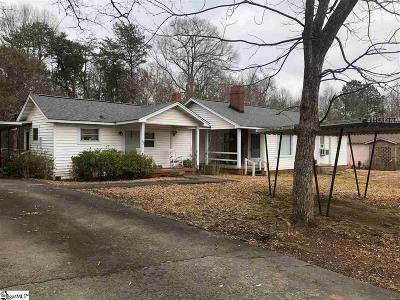 Fantastic investment opportunity in the desirable Easley area. Whether you are looking for an income producing primary residence or strictly an investment property this Duplex with detached studio apartment is the one for you! Unit A features 2BR 1BA, 10x14 Kitchen, 8x10 dining room and 15x15 Great Room and fenced-in backyard. Unit B features 1BR 1BA, 10x11 Kitchen, 8x11 Dining Room and 12x18 Great Room and covered porches. Unit C is the perfect studio apartment and features a 14x20 eat-in kitchen and 20x24 living space / bedroom area. Unit B was the original home-place and was connected to sewer in the 1950s. Unit A was added on in 1953 and Unit C was added in 1955 and used as a Hair Salon for many years. All three units are under one water/sewer meter, Units A and B share electricity and gas meters and C is separate. Proximity to city amenities, schools and medical facilities makes this one perfect for families with children, working adults or retired. Better hurry, this one will go fast.